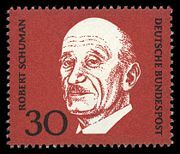 German stamp (1969) in honor of Robert Schuman. Robert Schuman (June 29, 1886 - September 4, 1963) was a noted French Statesman. Schuman was a Christian Democrat (M.R.P.) and an independent political thinker and activist. After qualifying as a lawyer in 1912, he began his own legal practice. First elected to parliament in 1919 after serving on the city council of Metz, he was arrested in 1940 by the occupying Nazi administration but escaped to join the Resistance. After World War II he was Finance Minister (June 24, 1946 to November 24, 1947), then Prime Minister from November 1947 to July 1948. He served a second, brief term in September 1948. He was Justice Minister 1955–1956. It was, however, as Foreign Minister (July 26, 1948 to January 8, 1953) that he began to translate his vision of ending war and of forging a new relationship between Germany and France. With Alcide De Gasperi, Konrad Adenauer, and Jean Monnet he was instrumental in building what became the European Union and other institutions including the Council of Europe and NATO. Schumans's concept of supra-national democracy and his vision of making war "unthinkable and materially impossible" have taken the people of Europe a long way towards establishing a secure and stable society across state borders. Cooperating interests would remove "war" from human language. Schuman's contribution also helped to place human rights and promoting the common good at the center of the new European Community. This has become a model of how humanity might develop global institutions of cooperation to ensure peace and prosperity across the globe. Schuman's deep Christian faith compelled him to selfless service; remaining celibate, he saw his career as a lay-vocation. A leader of his own nation, Schuman saw the welfare of all people as properly his concern. Robert Schuman's father, Jean-Pierre Schuman (1837–1900), was born a French citizen in Évrange, Lorraine, just across the border from Luxembourg. His mother tongue was Luxembourgish. After Lorraine became part of Germany in 1871 (Imperial Province of Elsaß-Lothringen), he became a German citizen. Robert's mother, Eugénie Duren (1864–1911), a Luxembourgian lady born in Bettembourg, became a German citizen by marriage in 1884. Although born in the suburb of Clausen, Luxembourg City, Robert Schuman was German by virtue of the principle of jus sanguinis; he took up French nationality only in 1919, after Alsace-Lorraine had been given back to France. His mother tongue was Luxembourgish (at the time considered a German dialect), his second language Standard German. Since he learned French only in school (as every Luxembourger does) he spoke it with a Luxembourg/Lorraine German accent. Schuman's pursued his secondary education at the Athénée de Luxembourg secondary school in Luxembourg, a former Jesuit College. He then decided to study at German universities but as the Luxembourg secondary school diploma was not valid in Germany, he had to pass the entrance exam for this, the Abitur, at the Kaiserliche Gymnasium in Metz. His university education in law, economics, political philosophy, theology, and statistics took place in the German education system. He received his law degree, after studying at the University of Bonn, the University of Munich, the Humboldt University in Berlin and in Strasbourg in Alsace (then Germany). After the death of his mother in a coach accident Schuman may have briefly considered the religious life, but resolved to pursue a lay apostolate. He remained single and celibate throughout his life. He became a lawyer, and was judged medically unfit for military call-up. (He served in a civilian capacity during the First World War and never wore a German uniform.) He was a member of the city council of Metz as well as the German Katholikentag. After the First World War, Alsace-Lorraine was retaken by France and Schuman became active in French politics. In 1919, he was first elected as deputy to parliament on a regional list later serving as the deputy for Thionville until 1958 with an interval during the war years. He had a major contribution to drafting and parliamentary passage of Lex Schuman in French parliament. Schuman investigated and patiently uncovered postwar corruption in Lorraine steel industries. In 1940, because of his expertise on Germany, Schuman was called to become a member of Paul Reynaud's wartime government. Later that year he was arrested for acts of resistance and protestation at Nazi methods. He was interrogated by the Gestapo. Thanks to an honorable German he was saved from being sent to Dachau. Transferred as a personal prisoner of the vicious Nazi Gauleiter Joseph Buerckel, he escaped in 1942, and joined the French Resistance. Although his life was still at risk, he spoke to friends about a Franco-German and European reconciliation that must take place after the end of hostilities, as he had done also in 1939-40. After the war Schuman rose to great prominence. He was Minister of Finance 1946-1947, then twice Prime Minister (November 24, 1947–July 26, 1948 and September 5, 1948–September 11, 1948). He was part of the Third Force coalition governments which opposed to both the Communists and Gaullists. He became Foreign Minister in July 1948 and held this post until December 1952. From 1955 until 1956, he was Justice Minister, succeeded by the future President, François Mitterrand. Schuman's government proposed the creation of a European Assembly, the first government to do so. This proposal saw life as the Council of Europe and was created within the schedule Schuman had set. At the signing of its Statutes at St. James's Palace, London, May 5, 1949, the founding States agreed to define the frontiers of Europe based on the principles of human rights and fundamental freedoms that Schuman enunciated there. His war-time experiences had already convinced him that Germany and France needed to form a new relationship. His own joint cultural heritage inclined him towards reconciliation between these two traditional rivals. In September 1948, as Foreign Minister, he announced before the United Nations General Assembly France's aim to create a democratic organization for Europe which a post-Nazi and democratic Germany could join. In 1949-50, he made a series of speeches in Europe and North America about creating a supranational European Community. This structure, he said, would create lasting peace between States. On May 9, 1950, these principles of supranational democracy were announced in a Declaration jointly prepared by Paul Reuter, the legal adviser at the Foreign Ministry, his chef-de Cabinet, Bernard Clappier and Jean Monnet and two of his team. The French Government agreed to the Schuman Declaration which invited the Germans and all other European countries to manage their coal and steel industries jointly and democratically in Europe's first supranational Community with its foundational institutions, namely the High Authority, the common assembly, the council of ministers, the court of justice and a Consultative Committee (this was to included representatives from labor and from civil society). From the outset, the aim of this initiative was no less modest than to create a peaceful world. The vision went beyond Europe; "World peace cannot be safeguarded without the making of creative efforts proportionate to the dangers which threaten it," the statement declared. Ending the age-old enmity between France and Germany was a crucial first step; "It will be built through concrete achievements which first create a de facto solidarity. The coming together of the nations of Europe requires the elimination of the age-old opposition of France and Germany. Any action taken must in the first place concern these two countries." "A common economic system" might become "the leaven from which … wider and deeper community between countries long opposed to one another by sanguinary divisions" would develop and mature. The development of Africa was also to be one of the Community's "essential tasks." The sharing of coal and steel and other natural resources would create a "foundation for … economic unification." Schuman himself linked ending war with reducing world poverty because instead of spending money making arms, resources can be used to feed the hungry. Rejecting war as a method to resolve disputes, industry would be channeled away from the manufacture of weapons and its production "offered to the world as a whole without distinction or exception, with the aim of contributing to raising living standards and to promoting peaceful achievements." He saw the whole enterprise as a scientific project. Europe was to serve as a laboratory, exploring new ways to forge universal friendship. From the start, the initiative had a social agenda, "the equalization and improvement of the living conditions of workers" across Europe. The longer term aim was to create a "European federation" that was, Schuman believed, "indispensable to the preservation of peace." On April 18, 1951, six founder members signed the Treaty of Paris (1951) that formed the basis of the European Coal and Steel Community. They declared this date and the corresponding democratic, supranational principles to be the "real foundation of Europe." Three Communities have been created so far. The Treaties of Rome, 1957, created the Economic community and the nuclear non-proliferation Community, Euratom. Together with intergovernmental machinery of later treaties, these eventually evolved into the European Union. 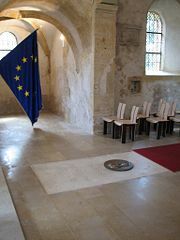 The Schuman Declaration was made on 9 May 1950 and to this day May 9 is designated Europe Day. As Prime Minister and Foreign Minister Schuman was also instrumental in the creation of the North Atlantic Treaty Organization, NATO. Schuman also signed the Treaty of Washington for France. The defensive principles of NATO's Article 5 were also repeated in the European Defense Community Treaty which failed as the French National Assembly declined to vote its ratification. Schuman was a proponent of an Atlantic Community. This was strongly resisted by Communists, ultranationalists, and Gaullists. Schuman was quickly joined by the Italian leader, Alcide De Gasperi and by the German Chancellor, Konrad Adenauer. Both men shared his vision of making war not only unthinkable but "materially impossible" and united their nations with his behind the new Community. In this task, they were assisted by Jean Monnet, who had drafted the Declaration. Monnet served as first president of the High Authority from 1952 until 1955. Schuman later served as Minister of Justice before becoming the first President of the European Parliamentary Assembly (the successor to the Common Assembly) which bestowed on him by acclamation the title "Father of Europe." In 1958, he received the Karlspreis, an Award by the German city of Aachen to people who contributed to the European idea and European peace, commemorating Charlemagne, ruler of what is today France and Germany, who resided and is buried at Aachen. Democracy owes its existence to Christianity. It was born the day man was called to realize in his daily commitment the dignity of the human person in his individual freedom, in the respect of the rights of everyone, and in the practice of brotherly love towards all. Never, before Christ, had similar concepts been formulated." In the same book, he spoke of how Europe was finally throwing off the "bonds of hate and fear" and realizing what "Christian brotherhood means." He was also a knight of the Order of Pope Pius IX. The Schuman Declaration anticipated the development of a European Federation. However, this was to be based on the principle of supranational democracy. Schuman saw this as a new development for humanity. Nations would choose to share power with others within democratic institutions. Nations would retain sovereignty, not cede this to a federal body. Participation in the supranational institutions would be voluntarily, governed by agreed rules. As the European Community developed, since a majority decision could compel a member state to act contrary to its interests, states retain the right of veto. Or, they can opt from aspects of policy or practice. There is little doubt, though, that Schuman thought the nation-state model had a limited future. He wanted to see old-style patriotism that too often fueled hostility towards other peoples replaced by a new style. This would value all that enriches humanity. It would open people up to the wealth and richness of human achievements; pride in cultural products would replace pride of race. Old style nationalism led to competition and war; new style would result in cooperation within a democracy of democracies. Schuman consistently stressed the final goal of world peace. He saw the Community as distinctive because it existed to abolish war, whereas most alliances have been defensive. For the Community, ending war was not to be merely a pleasant dream or a noble goal; it was to actively work towards this. "World peace cannot be safeguarded without the making of creative efforts proportionate to the dangers which threaten it," said the Declaration. The United Nations was to be regularly informed about progress. He was adamant that any attempt to exclude or sideline Germany in post World War II developments would be suicidal, repeating the mistake made after World War I. On March 19, 1958, the European Parliament declared that Schuman was the "Father of Europe." While credit for founding what evolved into the European Union is shared with others, there is little doubt that Schuman's contribution was crucial, representing France's commitment to permanently ending war in Europe. He placed human rights, democracy, and ending war at the heart of the new Europe. His concept of supra-national democracy and his vision of making peace "unthinkable and materially impossible" have taken the people of Europe a long way towards establishing a secure and stable society across state borders, a society that protects human rights and promotes the common good. This has become a model of how humanity might develop global institutions of cooperation to ensure a peaceful, prosperous world community. Schuman's deep Christian faith compelled him to selfless service; remaining celibate, he saw his career as a lay-vocation. He spoke of himself as an instrument, albeit imperfect, "of Providence" used by God for "purposes which are above us." On the one hand, he was open about how his faith informed his politics. On the other hand, he was happy to collaborate with those who did not share his religious convictions but who wanted to end war to create a new society in which all people could flourish. Alcide De Gasperi and Konrad Adenauer, like Schuman, pious Catholics; Jean Monnet was a humanist. All four loathed war. The Schuman District of Brussels (including a metro station, square and railway station) is named in his honor. Around the square ("Rond Point Schuman") can be found various European institutions, including the Berlaymont building which is the headquarters of the European Commission, as well as key European Parliament buildings. A building in the University of Limerick named the "Robert Schuman" building. This building is commonly referred to by the students of the University simply as "the Schuman," or jokingly as "the Shoeman." Schuman's place of birth house was restored by the European Parliament and can be visited; as can his home in Scy-Chazelle just outside Metz. In addition to the Robert Schuman Foundation, several education initiatives honor his memory including the Robert Schuman Center for Advanced Learning of the European University Institute at San Domenico di Fiesole—Italy, the L'Université Robert Schuman, a Social Science University in Strasbourg, France, and the Robert Schuman Institute for Developing Democracy in Central Europe at Budapest. ↑ 1.0 1.1 1.2 The Schuman Foundation, Declaration of 9 May 1950. Retrieved November 23, 2008. ↑ 2.0 2.1 Edoardo, Faith illuminated his political action, 30 Days in the Church and in the World. Retrieved November 23, 2008. ↑ Zen, citing from Robert Schuman, Pour l’Europe (Paris, FR:́ Editions Nagel, 1963). ↑ European Spirit, Robert Schuman: Memoirs Pour l’Europe. Retrieved November 23, 2008. Black, Cyril Edwin. 2000. Rebirth a Political History of Europe Since World War II. Boulder, CO: Westview Press. ISBN 9781429488556. Fimister, Alan. 2008. Robert Schuman: Neo-Scholastic Humanism and the Re-Unification of Europe. Philosophy and politics, 15. Bruxelles, BE: P.I.E. Peter Lang. ISBN 9789052014395. Fontaine, Pascal. 1990. Europe, a Fresh Start: The Schuman Declaration, 1950-90. Luxembourg, LU: Office for Official Publications of the European Communities. ISBN 9789282612200. Nelsen, Brent F., and Alexander C-G. Stubb. 1994. The European Union: Readings on the Theory and Practice of European integration. Boulder, CO: L. Rienner. ISBN 9781555875053. Schuman Project, biographical information plus analysis of Schuman's work initiating a supranational European Community, why it is a major political innovation, and its comparison with classical federalism. Site includes some of Schuman's key speeches announcing the innovation in 1949-50. Video of the Schuman Declaration of the creation of the ECSC - European NAvigator. 1949 letter from the UK Foreign minister Ernest Bevin to Robert Schuman, urging a reconsideration of the industrial dismantling policy in Germany. This page was last modified on 15 July 2015, at 16:09.